The difference between thug and role model is not as wide as you may think. If the security guard had used “more force than was necessary” against the people beating up Mathieu Bastareaud would he be under investigation, I wonder? Either way, I hope the Police find the scumbags who beat up the French player outside the stadium, so we can get back to focussing on the heros who beat up the French players inside the stadium. One of the best new blogs that I’ve started reading this year is Science of Sport by Jonathan Dugas and Ross Tucker from South Africa. The pic above comes from #7, and shows the final lunge for the wall in the men’s 100m butterfly at the Olympics. 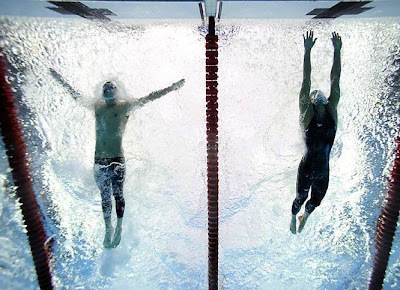 The winner of this race, incredibly, was Michael Phelps, who is on the left. For the second time in as many matches, yesterday’s Twenty-20 cricket international between New Zealand and the West Indies ended in a tied match. Last time they used a bowl off to determine the winner, with bowlers from each team bowling at unprotected wickets. Hit and miss! It was fantastic. However, this time around they used a new system. Once again this was apparently the first time this system has been used, and there seems to be some confusion about what it’s called – either The Eliminator, or The Super Over. I would suggest The Shambles. When you have a tied match there are a couple of possible options which would all make much more sense than this crazy system. To keep it simple they could come up with some other measure by which to determine a winner immediately – e.g. the team who has lost the fewest wickets, or the team who has hit the most sixes or boundaries during the match, or the team with the highest individual scorer … whatever, there are hundreds of candidates. It needs to be quick – Yesterday it took more than 30 minutes from the end of the match to determine a winner. In proportion to the length of the whole match, that’s too long. It needs to be decisive – Giving each team another over is not necessarily going to produce a clear winner, so there is a reasonable chance that you go through this whole process and still end up picking a winner by some arbitrary measure (see above). It needs to be obvious – I don’t know how well they explained what was going on to the crowd at the ground, but I’m assuming that there were lots of people who were totally lost. The commentator on TV read out the full list of rules, and confused more than he clarified. The model here should be the penalty shoot-out in football. Sure it’s a terrible way to determine the winner, but it’s immediate and dramatic, and at the end one team is the winner and one team is the loser – and the poor bugger who missed the decisive shot is devastated. Perfect! Frustratingly, there is an obvious method they could use which would meet all of these criteria. Bring back the bowl off, I say!